I’ve moved between three states within the last year and every time it caused me to look over my wardrobe and question if what I had was worth it. The closet cleanse I went through started in California and I realized how many things were just a huge waste of space. I never wore certain pieces and they took up too much room in my suitcase. Through the last two moves, I was able to look through what I wore and see if it was seasonally fit (I moved to a four seasoned location, so this was something I really had to think about… yeah, Southern California wasn’t helping me out here). It really helped me to determine what was necessary, what was just wasted space, and one last thing that I don’t think anyone ever talks about when they bring up closet cleansing. I’ll be talking about this in the next few steps and it’s helped me repurpose my past clothing decisions. Everyone talks about doing this as the first step, so I thought I’d be cliché and do the same thing. Ya know, join the bandwagon and all… mostly because I don’t see another step I could do before this. So here’s the oh-so helpful “cliché” step when starting out with your closet cleanse. Take all the clothes out of your closet (or dresser… or floor), put them in pile on your bed and sort through them, putting them into three categories. It’s kind of like the Cold Stone size category… except not as easy. Usually if you wear certain pieces a lot, “your go to,” you’ll want to note down that they’re usually comfortable pieces that fit you right and probably make you feel more confident when going out. This usually defines your style. Once you’ve decided that, do not put it in your closet just yet. Keep it out, there’s one last step you need to do with them. Your sometimes are pieces that you occasionally look at and have the urge to wear on any random day. They’re not frequent days and that may be for a few reasons. Perhaps they’re not as comfortable, you don’t always have an occasion to wear them, or you’re not sure what to pair them with. Put that into a neat pile, so you can sort through them at the end. This will be a part of the step I’m leading up to. Then there’s the Never pile. You bought that one skirt from your favorite store two years ago and for some reason it never makes it out of your closet. It could be that it doesn’t fit or it’s not your style anymore. Put these together neatly so they’re easily sorted and visible for the last step before being thrown or donated. Sort your clothes through seasons. Go through each pile and see what items would be best for the different seasons. So if you don’t live in Southern California like I did, then the majority of your clothes aren’t going to be light dresses, tank tops, and bright colors. Have that heavy coat that’s a staple for winter, but it’s still mild autumn weather? Put it in the winter category. Or is it a light blouse, but the spring weather hasn’t set in yet, put it in the spring category (being Captain Obvious, I know). Do this with each of the three piles. Don’t worry, it’s not as intimidating as it seems; not all of your piles are going to have something for all four seasons, and most likely, you can pair spring and summer or fall and winter together if it works. And once you’re done, you can put all of the seasonal clothes together (but keep it separate!). So for instance, your summer Go To, Sometimes, and Never Piles all get put next to each other. I promise, there’s a method to the madness! So here’s the step I’ve been leading up to that comes before the last step. It’s something that really helped me define and revamp my style. So when I cleansed my closet during those three moves, it opened my eyes to something I had been ignoring. And I finally came to a decision by the last wardrobe cleanup. There were a few pieces in the Sometimes and Never Pile that I had to utilize or knew it was too great not to try to pair with something. So I experimented; I tried on each of the clothes, and found out if it fit me well or not (or could be fixed if damaged). Then once I decided which ones worked positively for me, I kept them and put them in my Go To pile. Sounds weird if I never wear them, but this way, I wouldn’t just be wasting my money on clothes, I’d be making use of them and putting them where I could see them and making the mental decision to work them into my outfits every week. If it was something cute that I didn’t know what to pair it with, I’d go through the different piles and see if I could put it with something that worked and made it a great outfit. Sounds counter intuitive to the minimalistic mindset, but I assure you I’m still on the minimalism track. My reasons for this is because many times, people will purge themselves of clothes because of the last two piles, and then buy more. It’s a temptation! They threw away perfectly good clothes and then saw that they were lacking in areas, so they needed to compensate and spend more money after throwing away so much of it in clothing-form. This one is the easiest and it’s two fold. If you have clothes that you found still worked for you and you could put into your Go To pile, but they’re not the right season, then put it in a box and slide it under the bed, labeled for the right season. This will efficiently declutter your clothing space. The second part is to take all of the clothes that didn’t work, whether it wasn’t something you liked anymore or not the right size and put it in the donate pile. If it’s unfixable (torn, broken zipper, etc.) throw it in the trash. Yeah, this step is pretty simple… and probably the most satisfying. You’re decluttering your wardrobe and giving to people who are in need. Doing a wardrobe cleanse is a great way to also cleanse you of stress and help you with money management. So it’s a lot more than being organized, it helps you feel better about yourself and your decisions. 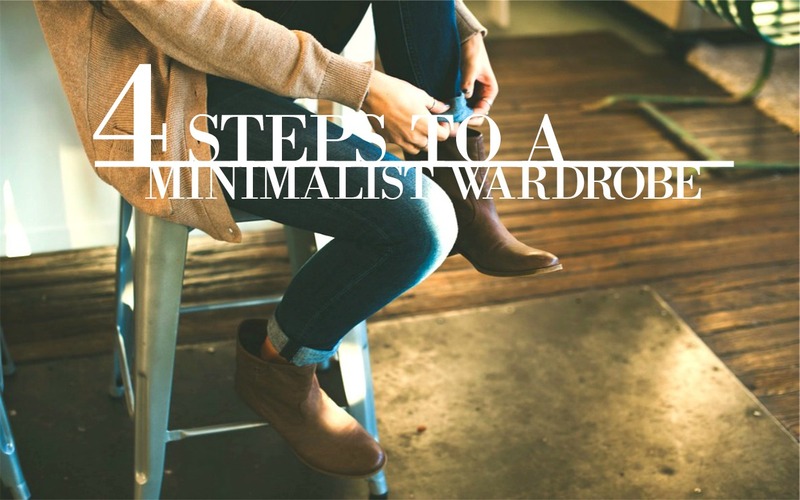 Now if you have any tips and advice on a minimalist wardrobe/closet cleanse, let me know in the comments or email me! I’d love to hear what you have to say!